People are inventing so many new ways to get high that lawmakers can't seem to keep up. WASHINGTON — People are inventing so many new ways to get high that lawmakers can’t seem to keep up. The drugs are often sold at small, independent stores in misleading packaging that suggests common household items like bath salts, incense and plant food. But the substances inside are powerful, mind-altering drugs that have been linked to bizarre and violent behavior across the country. Law enforcement officials refer to the drugs collectively as “bath salts,” though they have nothing in common with the fragrant toiletries used to moisturize skin. President Barack Obama signed a bill into law earlier this month that bans the sale, production and possession of more than two dozen of the most common bath salt drugs. But health professionals say lawmakers cannot keep pace with bath salt producers, who constantly adjust their chemical formulations to come up with new synthetic drugs that aren’t covered by new laws. Experts who have studied the problem estimate there are more than 100 different bath salt chemicals in circulation. There are no back alleys or crack houses in America’s latest drug epidemic. The problem involves potent substances that amateur chemists make, package and sell in stores under brands like “Ivory Wave,” ”Vanilla Sky” and “Bliss” for as little as $15. Emergencies related to the drugs have surged: The American Association of Poison Control Centers received more than 6,100 calls about bath salt drugs in 2011 — up from just 304 the year before — and more than 1,700 calls in the first half of 2012. Many states have banned some of the most common bath salts, which are typically sold by small businesses like convenience stores, tobacco shops and adult book stores. For instance, West Virginia legislators banned the bath salt drug MDPV last year, making it a misdemeanor to sell, buy or possess the synthetic drug. Conviction means up to six months in jail and a $1,000 fine. Stephanie Mitchell, assistant manager of The Den, a tobacco and paraphernalia shop in Morgantown, W.Va., said the store hasn’t sold bath salts in the six months that she’s worked there. But strung-out users still come in and ask for them. Despite the bans, bath salts producers are constantly tweaking their recipes to come up with new drugs that aren’t covered by local laws. In fact, Mark Ryan, director of the Louisiana Poison Center, says there are so many different drugs out there that it’s almost impossible to know what people have ingested, or how long the effects will last. 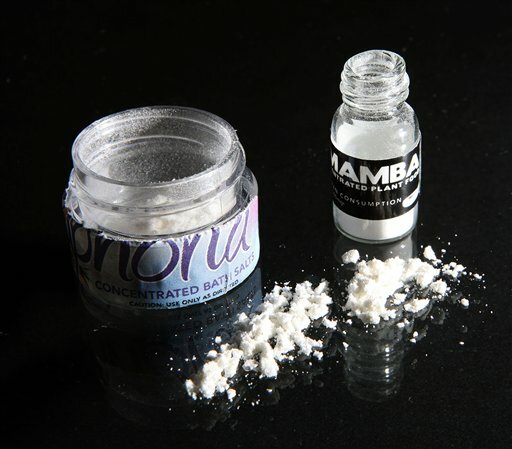 The most common bath salt drugs, like MDPV and mephedrone, were first developed in pharmaceutical research laboratories, though they were never approved for medical use. During the last decade they became popular as party drugs at European raves and dance clubs. As law enforcement began cracking down on the problem there, the drugs spread across the Atlantic Ocean. Poison control centers in the U.S. began tracking use of the drugs in 2010. The majority of the early reports of drug use were clustered in Southern states like Louisiana, Tennessee and Kentucky. But the problem soon spread across the country. The financial lure for small-time drugmakers is enticing. The drugs can be cheaply imported from China or India, and then easily packaged under local brands. For example, bath salts sold in Louisiana carry regional names like Hurricane Charlie or Bayou. The widespread availability of the drugs in stores is equally alluring for drug users: they can get a cheap high similar to that of illegal drugs by walking to a corner store. Use of these drugs has spread across the country with reports stretching from Maine to California. There are no official federal estimates on deaths connected with the drugs, many of which do not show up on typical drug tests. But police reports have implicated the drugs in several cases. Packets of “Lady Bubbles” bath salts, for instance, were found on Sgt. David Franklyn Stewart last April after the solider shot and killed his wife and himself during a car chase with law enforcement near Olympia, Wash. The chase began when Stewart sped past a police patrol car at 6 a.m. The police trooper pursued for 10 miles and reported seeing the driver raise a hand to his head, then heard a shot and saw the driver slump over. The next day police found the couple’s 5-year-old son dead in their home; he had been suffocated with a plastic bag at least 24 hours earlier. 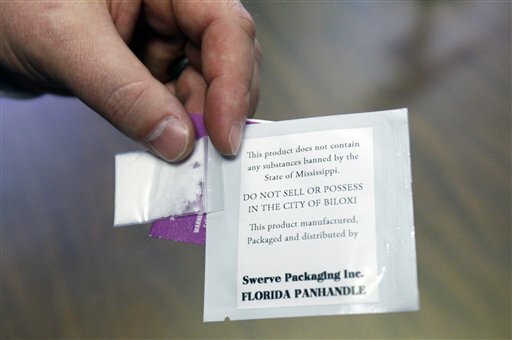 Another death involving bath salts played out in Covington, La. Police reported that Dickie Sanders, 21, shot himself in the head Nov. 11, 2010 while his parents were asleep. His father, Dr. Richard Sanders, said his son had snorted “Cloud 9” bath salts and endured three days of intermittent delirium, at one point attempting to cut his own throat. As he continued to have visions, his physician father tried to calm him. But the elder Sanders said that as he slept, his son went into another room and shot himself. Hospital emergency rooms, doctors and law enforcement agencies across the country have struggled to control bath salt drug users who often are feverish and paranoid that they are being attacked. Doctors say users often turn up naked because bath salts raise their body temperature so much that they strip off their clothing. Cookeville Regional Medical Center in Tennessee has treated 160 people suspected of taking bath salts since 2010. Dr. Sullivan Smith, who works there, said people on the drugs become combative, and it can take four or five health professionals to subdue them. In some cases, he said, doctors have to use prescription sedatives that are typically reserved for surgery. Smith recalls one man who had been running for more than 24 hours because he believed the devil was chasing him with an ax. By the time police brought him to the hospital, he was dehydrated and covered in blood from running through thorny underbrush. To control the spread of the problem, the Drug Enforcement Agency issued a temporary ban in October on three of the most common drugs — mephedrone, methylone and MDPV. That ban became permanent under the bill signed by Obama on July 10. Under the law, anyone convicted of selling, making or possessing 28 synthetic drugs, including bath salts, will face penalties similar to those for dealing traditional drugs like cocaine and heroin. Those on the front lines say the legislation is a good start. But they don’t expect new laws to dramatically curb use of bath salts in the near term.